Should my business bank-loan be set up as a liability account or as a credit card/bank account? How can I change a liability or asset account to a bank account? To use Xero in the most efficient way, you need to decide what your operational needs are. 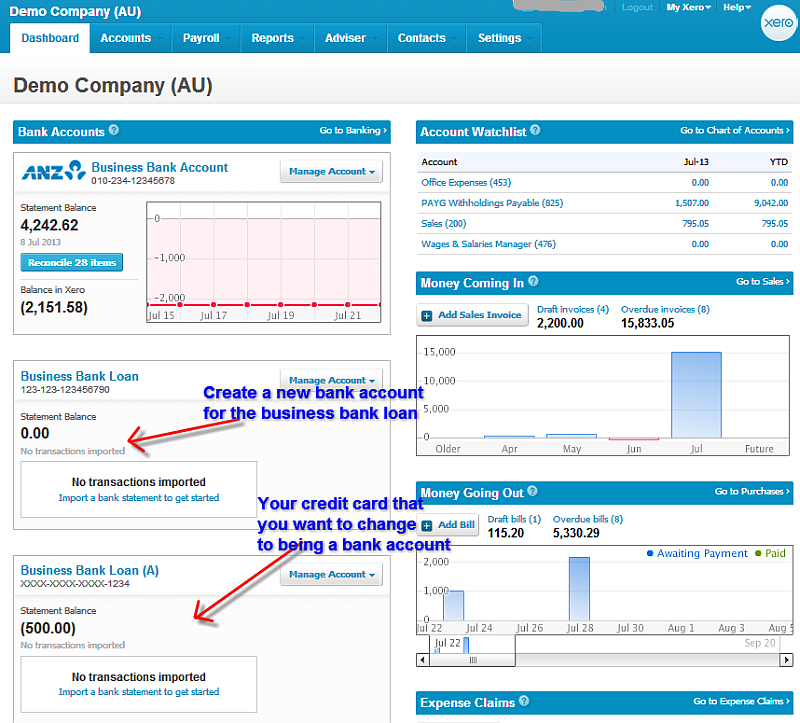 If you have a business bank loan which you want to be able to reconcile easily in Xero then YES you want to set it up as a bank account! Any account that you want to reconcile is best set up as a bank account. The next question is whether you can get bankfeeds for an account. To save time and increase accuracy, you would definitely connect it to your account where possible. The advantage of setting up a business bank loan as a bank account and connecting it with bank feeds, is that you can easily view your balance on the loan and it also makes it possible to reconcile the account. If you have accounts that are set up as bank accounts or a credit cards but you don’t have the need to reconcile, you might want to change it to a liability or asset account. 1. Go to the “Settings”, select “Chart Of Accounts” and search for the credit card you want to change. 2. Click on the credit card and rename both the account code and the account name by adding an “A” to the end of the lines. (Xero doesn’t allow you to use the same account code and name on two accounts so therefore we need to rename it “A” =Archive). Then press “Save”. 3. Add a new bank account, press the button “Add Bank Account”, put in the bank name, account name, account code, bsb and account number. At this point you have one bank account and one credit card. 4. Go to the “Chart Of Accounts” and select the credit card, what “YTD” balance can you view in here? Make a note of the amount and also if it is an negative or positive amount. If the YTD balance on the credit card is $1 then go to the “Manage Account” button for the credit card and select “Transfer”. Select the day after when you had your last transaction in that account and type in $1 and press “Save”. Then the “Statement Balance” in the credit card should be $0 and we are ready to archive this account. If the “YTD” balance in the credit card is ($500) then go to “Manage Account” button for the bank account and select “Transfer”. Select the day after when you had your last transaction in the credit card and type in $500 and press “Save”. If you look at the “Statement Balance” of the credit card it is now $0 and we are now ready to archive this account. 5. Our next step is to archive the credit card, so that you are left with one account for the bank-loan, which should be the newly created bank account. By archiving it we have the full audit trail (all historical reports will show the details of the archived account, but it is not available for new transactions) and we can view when it was changed etc. Archive the account by going to “Setting”, select “Chart Of Accounts” and search for the credit card. When found, tick the box on the left-hand side and press the “Archive” button. Answer: The steps are similar to the above example with some slight differences. 1. Go to the “Settings”, select “Chart Of Accounts” and search for your bank-account/credit card that you want to change. 2. Click on the bank account/credit card and rename both the account code and the account name by adding an“A” in the end of the lines. (Xero doesn’t allow you to use the same account code and name on two accounts so therefore we need to rename it “A” =Archive) Press “Save”. 3. Then add a new asset or liability account all depending on what you want to create, press the button “Add Account”, select the account type, add the account code, the name and a description is optional. Select the default tax rate and also tick the box “Enable payments to this account”. Then press “Save”. At this point you have one bank account/credit card and one asset or liability account. 4. Go to the “Chart Of Accounts” and select the bank account/credit card, what “YTD” balance can you view in there? Make a note of the amount and also if it is an negative or positive amount. If the “YTD” balance in the bank account/credit card is positive then you will need to go to the “Manage Account” button and select “Spend Money”. In the “To” I would type in “transfer” as a contact, select the date after the last transaction in this account and add a reference example: “Changing bank account to being an asset account as it should be”. Then copy the reference and put it in the “Description”, add “1” as quantity, the unit price is the “YTD” balance and select the asset account, tax rate “bas excluded” and then make sure you press “Save”. If you look at the “Statement Balance” of the bank account/credit card it is now $0 and it is fine to archive the account. If the “YTD” balance in the bank account/credit card is negative then you will need to go to the “Manage Account” button and select “Receive Money”. In the “To” I would type in “transfer” as a contact, select the date after the last transaction in this account and add a reference example: “Changing bank-account to being an asset account as it should be”. Then copy the reference and put it in the “Description”, add “1” as quantity, the unit price is the “YTD” balance and select the asset account, tax rate “bas excluded” and then make sure you press save. If you look at the “Statement Balance” of the bank-account/credit card it is now $0 and it is fine to archive the account. 5. Our last step is to archive the bank account/credit card, so that you are left with only the asset or liability account. By archiving it we have the full audit trail and we can view when it was changed etc. Archive the account by going to “Settings”, select “Chart Of Accounts” and search for the bank-account/credit card. When found, tick the box on the left-hand side and press the “Archive” button. 1. Go to the “Settings”, select “Chart Of Accounts” and search for your asset/liability account that you want to change. 2. Click on the asset/liability account and rename both the account code and the account name by adding an“A” in the end of the lines. (Xero doesn’t allow you to use the same account code and name on two accounts so therefore we need to rename it “A” =Archive) Press “Save”. 3. Then add a bank account, press the button “Add Bank Account”. Type in “the bank name or “no matches if there is a none bank, add the account name, the account code, and either a real or made up BSB and account number and press save. At this point you have one bank account and one asset or liability account all depending on what you are creating. 4. Go to the “Chart Of Accounts” and select the asset/liability account, what “YTD” balance can you view in there? Make a note of the amount and also if it is an negative or positive amount. Go to the “Manage Account” button of the newly created bank-account and select “Spend Money”. In the “To” I would type in “Transfer” as a contact, select the date after the last transaction in the asset/liability account and add a reference example: “Changing bank-account to being a asset/liability account as it should be”. Then copy the reference and put it in the “Description”, add “1” as quantity, the unit price is the “YTD” balance amount and select the asset/liability account, tax rate “bas excluded” and then make sure you press “Save”. If you look at the “Statement Balance” of the asset/liability account it is now $0 and it is fine to archive the account. By archiving it we have the full audit trail and we can view when it was changed etc. Archive the account by going to “Settings”, select “Chart Of Accounts” and search for the asset/liability account. When found, tick the box on the left-hand side and press the “Archive” button. Go to the “Manage Account” button of the newly created bank-account and select “Receive Money”. In the “To” I would type in “Transfer” as a contact, select the date after the last transaction in the asset/liability account and add a reference example: “Changing bank-account to being a asset/liability account as it should be”. Then copy the reference and put it in the “Description”, add “1” as quantity, the unit price is the “YTD” balance amount and select the asset/liability account, tax rate “bas excluded” and then make sure you press “Save”. If you look at the “Statement Balance” of asset/liability account it is now $0 and it is fine to archive the account. By archiving it we have the full audit trail and we can view when it was changed etc. Archive the account by going to “Setting”, select “Chart Of Account” and search for the asset/liability account. When found, tick the box on the left-hand side and press the “Archive” button. I would recommend you to go through your chart of accounts when changing systems and think about what would be the best way of managing this for your company or client. In the end you want to save yourself time, be able to easily reconcile and make sure that all of your accounts are updated and with the correct account balances. Remember that if you are unsure about anything contact your accountant for support and advice. Once this is set-up in the ideal way for the company, you will find that your Xero journey will be fun and run smoothly!